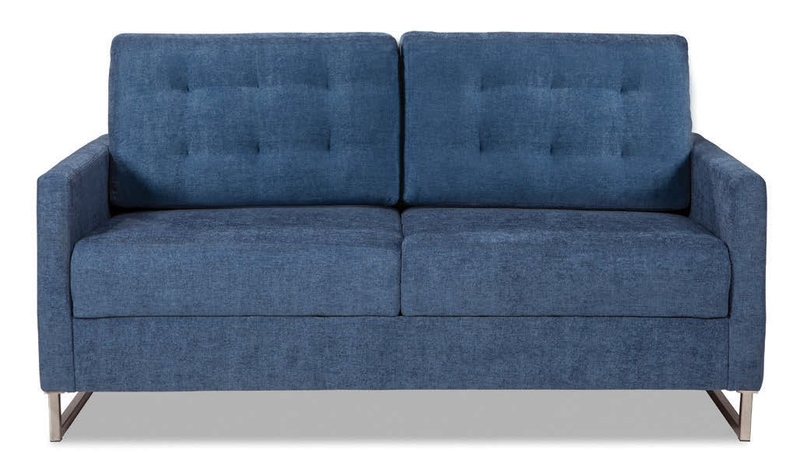 When you think of a sleeper sofa, what ideas and images come to mind? Probably a couch that’s uncomfortable to sit on as well as uncomfortable to sleep on. You think of the tedious process of removing all the cushions and pulling out the heavy metal frame with springs and a thin mattress. You may have been the victim of back pain from sleeping with a bar under your back all night. And on top of all that, sleeper sofas can be expensive. Forget everything you think you know about sleeper sofas and try a DreamSleep® sofa. Comfort, convenience, and style come together in one piece of furniture that is comfortable in both couch and bed form. Solid sleep platform with 4″ of high resiliency foam delivers unparalleled sleeping comfort. No bars, no springs, no sagging. Patented and revolutionary new sleep sofa sits and sleeps as good as it looks. Easy conversion. Simply remove the back cushions and unfold the seating cushions into the bed. Some models even include a hinged one-piece back pillow that pushes up and out of the way while in bed form, remaining attached. To convert back to sofa form, simply fold the seat cushions back into place and either push the hinged back cushion down into place or return back pillows to their original position. Space Saving. Mechanism design allows a queen size bed to fit in a full-size sleeper frame, making the sofa more compact to fit in smaller spaces. DreamSleep® sofas are designed for commercial as well as personal use. Hotels and homes alike can add extra sleeping space in any room by adding a DreamSleep® sofa. Compact enough to fit in tight spaces while still offering a queen-size mattress, Southfield’s original patented design saves inches of floor space without losing any sleep space. It looks cozy enough to suit your home and makes hotels feel more like home. DreamSleep® sofas come in a variety of colors, patterns, and fabric textures to fit any home or commercial décor. Southfield Furniture has established a reputation for excellence in hotel bedding. DreamSleep® sofas are a favorite among hotel chains nationwide for their comfort, convenience, and style. Innovative design technology has eliminated the common problems with traditional sleeper sofas like uncomfortable bars, springs, and sagging. Find out why more customers are trusting their hospitality interiors to Southfield Furniture. Call 336-434-6220 to try a DreamSleep® sofa today. Attached back pillow and/or tight back styles feature a pneumatic and hinged mechanism that lifts the back out of the way when opening the sleeper. 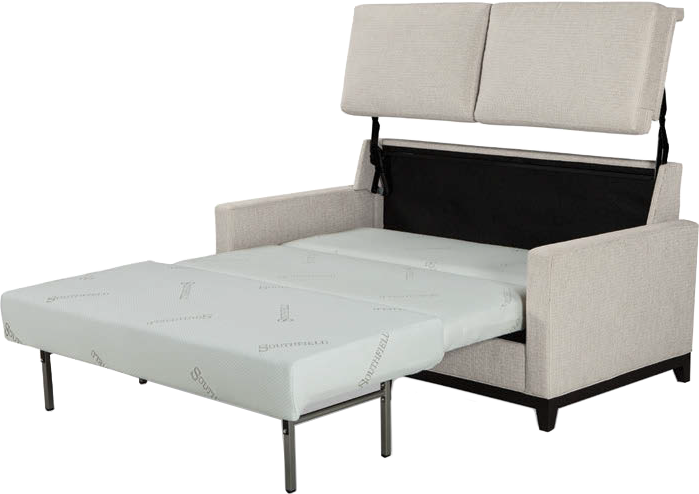 DreamSleep was designed to be the ultimate sleep sofa for problems with guestroom suites that require comfortable and stylish sleepers in a smaller footprint. Each sofa is a full 80″ in length, yet still require less floor space than a traditional sleeper. A Queen size sleeper fits in a Full size frame. The body construction of each DreamSleep sofa features an industry tested hardwood frame that is double dowelled, screwed, glued, and corner blocked. The seating area features no-sag springs and is tailored in your COM fabrics. The sleeping area features a solid sleep platform of hardwood plywood covered with 4″ of high density / high resiliency polyurethane foam which eliminates sagging. There are no springs or bars underneath. The sleeper is covered with a luxurious stain-proof ticking for easy care and cleaning. Solid sleep platform with 4″of high resiliency foam delivers unparalleled no springs, no sagging. 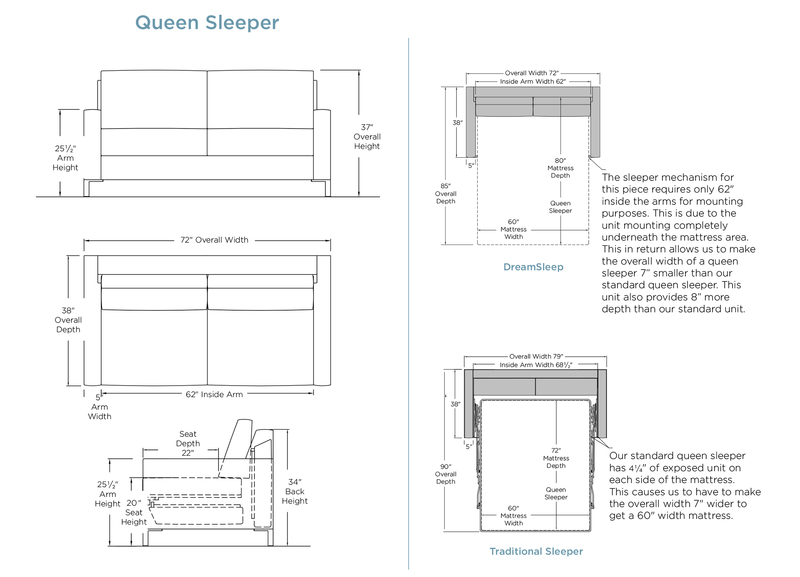 Mechanism design allows a queen size bed to fit in a full size sleeper frame.